We are a family owned and operated Truckee Auto Body Repair shop and have been servicing our community since 1997. You have the right to choose the body shop of your choice. Your insurance company may try to get you to go to a shop of their choice and tell you that if you bring your car to another shop they cannot guarantee the work. 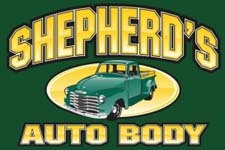 We at Shepherd’s Auto Body guarantee all our work. We work with all major insurance companies. Our people are professionally trained craftsmen who will do a quality job of restoring your vehicle at a fair price.. Your satisfaction is what we strive to achieve. When you are satisfied, than you will keep coming back when you need our services, you will also tell your friends and that is what we are here for. You the customer are the most important part of our business. So when you are happy, we are happy..